I hate solo home runs. I should qualify it by saying I do not dislike home runs…I just prefer to see men on base when it happens. 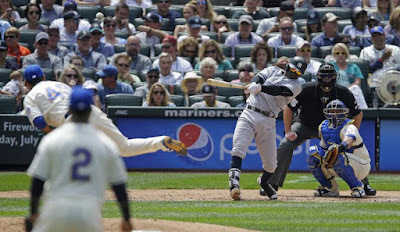 After the Yankees clubbed three home runs (of the solo variety), the Mariners were able to rally past the Yanks against starter Caleb Smith before the Yankees rebounded to take the win, courtesy of Red Thunder (Clint Frazier) and the blazing heat of the bullpen. Caleb Smith was solid…for three innings. Early, he was backed by homers. Brett Gardner led off the game with his 17th homer of the season off Mariners starter Yovani Gallardo (breaking his tie with Matt Holliday to take sole possession of second place for team homers behind Aaron Judge). The hit was #1,040 of Gardner’s career, breaking a tie for 39th place on the all-time franchise list with Tino Martinez. Next within Gardner’s sights is #38 Yanks hit leader, Charlie Keller, with 1,053 hits. 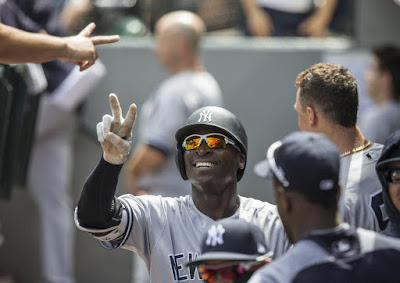 In the second inning, Didi Gregorius launched a line drive homer to right center as the Yankees increased their lead to 2-0. Gregorius led off the 4th inning with another shot to the right field stands for his second home run of the game. It was Didi’s first multi-homer game in his young career. Staked to a 3-0 lead, Smith couldn’t hold it in the 4th inning. After breezing through the first three innings allowing only a meaningless second inning double, the Baseball Gods turned against Smith. Danny Valencia got the party started with a single to right. 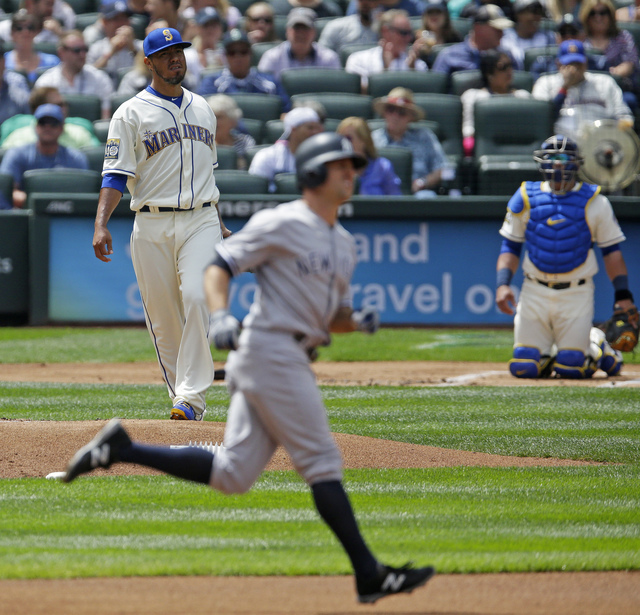 Robinson Cano followed with a liner to right, moving Valencia to second. Smith had Nelson Cruz in a 3-2 count but lost him with Ball 4 to load the bases. For a moment, it looked like Smith might escape the 4th inning unscathed. He struck out Kyle Seager and got Mitch Haniger to fly out in right field foul territory. But Ben Gamel, thoroughly enjoying this series against his former team, singled to score Valencia and Cano. The Yankees held a slim 3-2 lead. Guillermo Heredia followed with a double to left which scored Cruz and Gamel as the Mariners took a 4-3 lead. End of game for Caleb Smith. A round of ovation for Chad Green. While the entire bullpen was magnificent, Green was outstanding. He struck out Carlos Ruiz to end the 4th, and pitched two more innings without allowing a hit and struck out 3. He has thrived in his current role and this performance was critical as it set the stage for the Yankees’ comeback in the top of the 6th inning. With one out in the top of the 6th, both Chase Headley and Todd Frazier walked against reliever and former Yankee James Pazos. Ronald Torreyes, pinch-hitting for second baseman Tyler Wade, singled to right to load the bases. Brett Gardner followed with a single to left, scoring Headley with the tying run. The Mariners pulled Pazos and replaced him with Tony Zych. Clint Frazier greeted Zych with a double to left, scoring both Frazier and Torreyes as the Yanks moved ahead, 6-4. 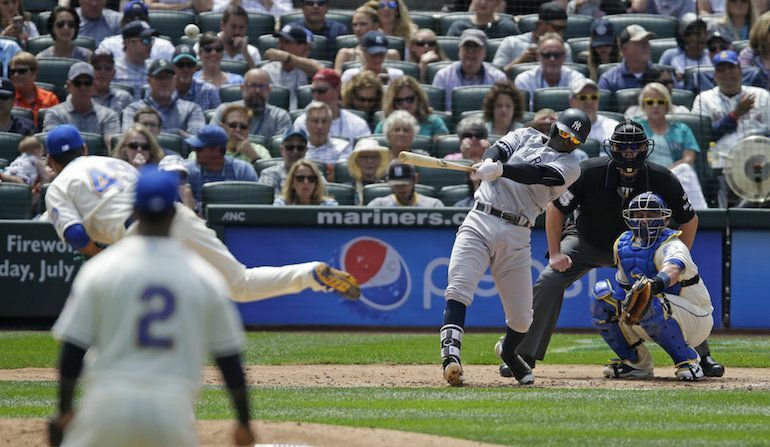 Zych intentionally walked Aaron Judge, much to the dismay of the Yankee fans in attendance at Safeco Field, but it proved the right decision for the M’s since Gary Sanchez popped out and Matt Holliday grounded into the final out. From there, it was up to the rest of the bullpen. Dellin Betances and David Robertson pitched clean 7th and 8th innings, respectively, pushing the game to the final inning and last licks for the Mariners. The Yankees had a chance to add an insurance run in the top of the 9th. 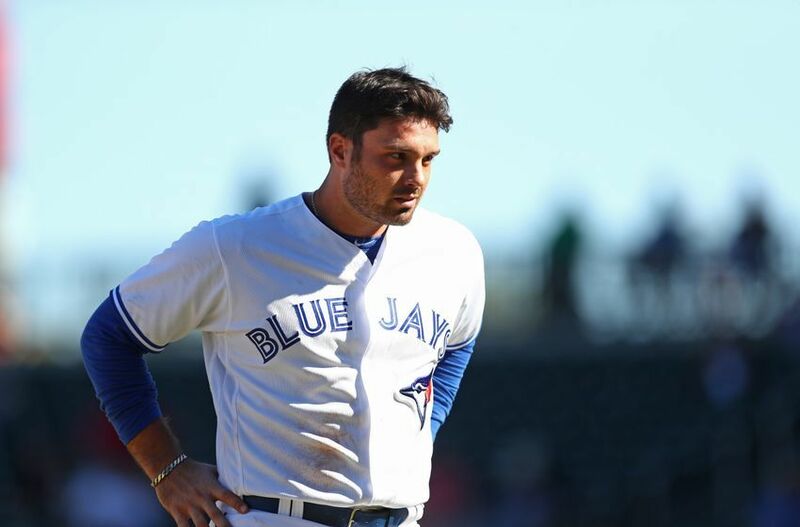 Matt Holliday walked with one out and was replaced by pinch-runner Jacoby Ellsbury. After Didi Gregorius flied out the second out, Chase Headley hit a liner into the right field corner. Ellsbury came flying around the bases but the relay from right fielder Mitch Haniger to second baseman Robinson Cano to catcher Carlos Ruiz was on target and just ahead of the sliding Ellsbury for the final out. The bottom of the 9th brought Aroldis Chapman and a little holding of the breath to see what type of command he would have. Nelson Cruz, the first batter, reached with a hit that ricocheted off Chapman and retrieved too late by Didi Gregorius to get Cruz at first. The M’s replaced Cruz with pinch-runner Taylor Motter, who sports a similar “Johnny Damon Caveman“ look like Ben Gamel, to get some speed on the base paths. Fortunately, Chapman caught him off first and it was an easy rundown by Chase Headley for the first out. It proved to be invaluable as the next hitter, Kyle Seager, doubled to center. A passed ball by Gary Sanchez allowed Seager to move to third. The game would have looked much different had the Yankees not gotten Motter out. He most likely would have scored with Seager representing the tying run just 90 feet away. As it was, the tying run was still at the plate. Mitch Haniger had first crack but he popped out to Ronald Torreyes. Last chance came up in the form of new Yankee-killer Ben Gamel. But with Chapman’s blazing heat inching up the velocity chart, Gamel went down swinging. Game over. Yankees win. The Yankees win! 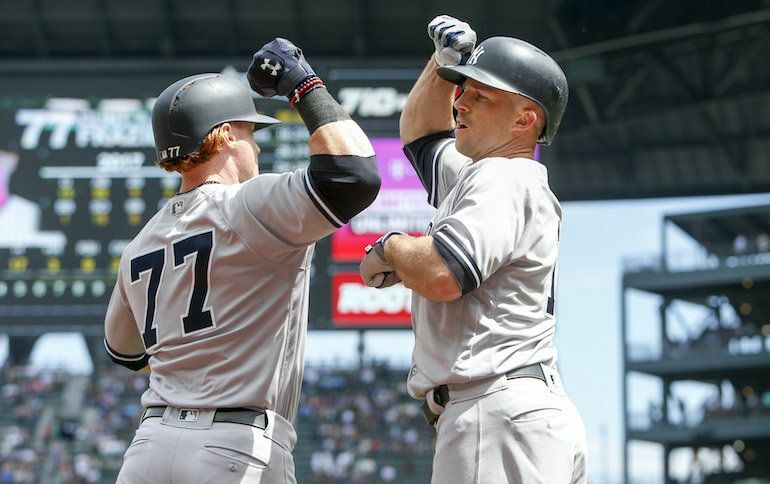 Unlike Saturday when the Yankees failed to gain any ground following losses by the Boston Red Sox and the Tampa Bay Rays, Sunday was the opposite. With the win, the Yankees (51-46) took sole possession of second place in the AL East and moved 2 1/2 games behind the Red Sox. The Rays slipped a full game behind the Yankees (two games in the loss column). Both the Red Sox and Rays lost one-run games on Sunday. The Red Sox were defeated by the Los Angeles Angels, 3-2, while the Rays lost a tough 6-5 game to the Texas Rangers. Todd Frazier finally got a hit and scored a run so hopefully he’s starting to come around. His Yankee Stadium debut on Tuesday will feature a game against his original team, the Cincinnati Reds. So it should give Frazier added incentive when he makes his first home appearance in front of family, friends, and newfound Frazier fans in the Yankees Universe. Hopefully Gary Sanchez’s bat is waiting for him too. The Yankees made a rare intra-division trade on Sunday to send infielder Rob Refsnyder to the Toronto Blue Jays. The return is an underwhelming 25-year-old first base prospect who has failed to advance past Double A, Ryan McBroom. Here's hoping to much better success in the Yankees organization. Welcome, Ryan! And so, the Yankees story for Refsnyder ends with no fanfare. It is rather sad as most of us at one time wanted Ref to succeed as the second baseman for the Yankees. He never succeeded with his limited opportunities…either due to his own inability or the lack of chances or a combination of both. So long, Ref and best of luck as you continue your (hopeful) MLB career in Toronto. Also, in other transaction news, the Yankees announced they have outrighted first baseman Ji-Man Choi to Triple A Scranton/Wilkes-Barre. The competition for quality starters figures to be very intense as we enter the final week before the trading deadline. With news that Clayton Kershaw was pulled early from a start on Sunday due to lower back tightness (and a possible trip to the DL), the Los Angeles Dodgers will most likely be very aggressive in their pursuit of another top starter. The Texas Rangers figure to capture a King’s Ransom for two months of service from impending free agent Yu Darvish. 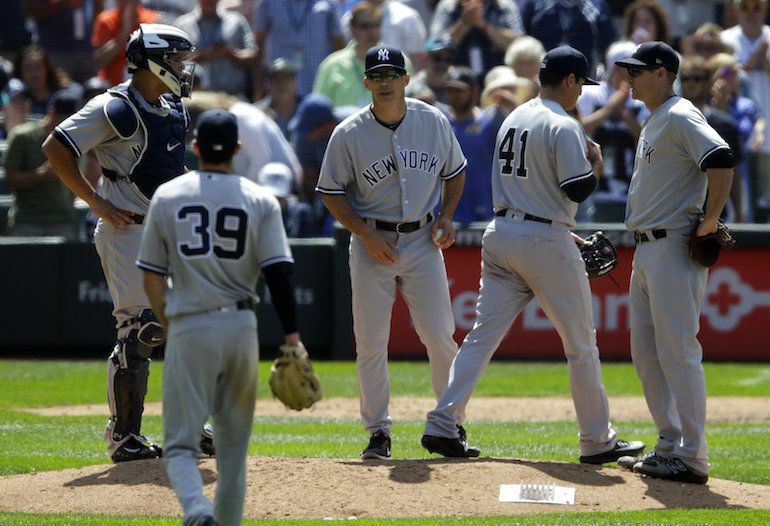 The Yankees starting rotation looks very vulnerable right now with Caleb Smith’s inability to get out of the fourth inning on Sunday and Masahiro Tanaka’s disappointing showing on Saturday. This week should be very interesting but probably a bit disappointing for Yankees fans if the team desires to retain its top prospects (which they should). Have a great Monday! The Yankees get to sleep in while the rest of us trudge off to work. Oh well, make it a wonderful day! Go Yankees! Who is the "Ligtning" that you are referring to? At first I thought you were talking about Judge. But you have a picture of Gardner. Considering his speed, that makes sense for Gardy. I also liked your reference to the bullpen as throwing heat. The storm references seem very appropriate this season! Yu Darvish....that is my solution, as the team moves forward. For the final piece to the rotation. A quality rental player in his walk year...will not come cheap. with arch rival Masahiro Tanaka is fascinating. his rival arrives! Brake out the rusty Samurai swords! Samurai...Tanaka, would mean going down the stretch. Maybe too many if's for one night, but imagine. Take care. Never even thought about that Patrick. As long as it doesn't cost Torres, Frazier, or Adams, I'd give them anything they want.